BWM & Victory Medal 1754 DVR. B.RUSSELL. 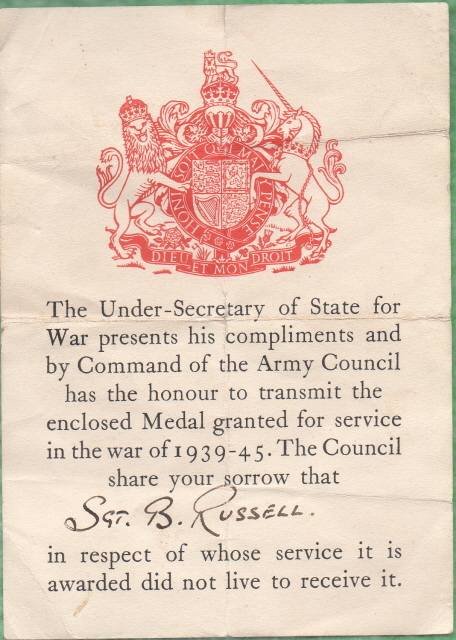 R.A.
Defence Medal un-named as issued. T.E.M. 528237 CPL. B.RUSSELL. NORTH'D. YEO. WW2 Slip shows him as Sergeant, Deceased. MiC's show him as Private Northumberland Hussars Territorial Foece, entered War 1.6.1916. T.E.M. Northumberland Hussars Yeomanry Corporal 528237 issued Army Orders November 1929.